Sorry for the lack of posts again, I've been unwell ever since the exhibition I visited a week ago, so my outings been pretty much limited to a couple of museums and uni obviously. In fact, here's an outfit from one of such random days. Please please don't comment on my hair, LOL. I know 90% comments on this blog are about it but I'm seriously tired of it and it's just a matter of time before I'm gonna have it chopped, meanwhile stocking up on some inspiration and ideas. I haven't deliberately done anything for it to grow that long or have this "ombre" effect. I used to experiment with my hair a lot when I was at school but when I got pregnant I stopped so you can imagine I'm craving for a change for a while now! You look absolutely gorgeous!! Amazing bag!! You look amazing, cute outfit! trying not to talk about your hair..
Great outfit! You are so beautiful:). This is so rocker chic! 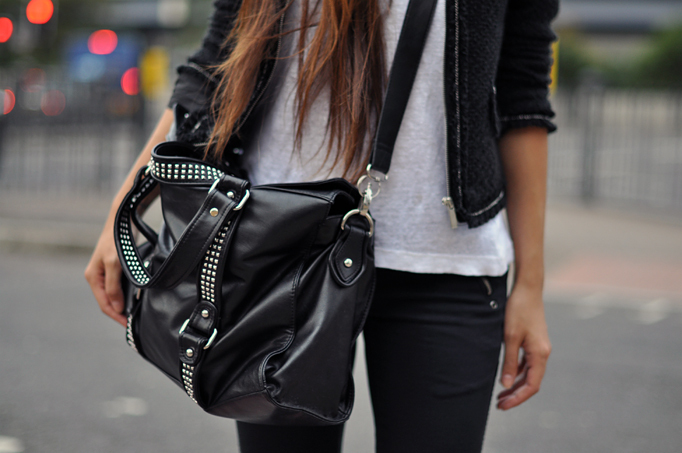 Completely enchanted with your studded bag and zipper trousers. I love all your outfit, is perfect in black and white, but I want to see your boots! Great b&w simplicity! You look stunning as usual! i really like the chain jacket. it's a beautiful outfit. i just can't stop looking at your perfect, long hair. how do you keep it so healthy? Did you bought the jacket recently? I want it too! You hair is... hahahah just kidding. you are so beautiful! i loved the black outfit and the bag is so pretty! Simplicity never looked better! You're so beautiful and fit, so anything looks good on you. Love your bag very much! looove the outfit! and your hair iz amazing! u are so beautiful, love your hair! love it!!! and the jacket is fantastic!!! what lipstick do you use? looks perfect. I love this look! This bag is stunning ! I love your hair! Especially with the lighter ends. Love the jacket..plus sorry couldnt stop myself love your hair!!! I want your jacket i love it !! did you buy it online ? you are so very very beautiful ! your so beautiful! lovely long hair and inspiring outfits. thank you. Stunning ! !1 and that jacket is to die fo!! i nmeed it in my life. Where di dyou get it from?